Hundreds of Tibetans staged protests over the seizure of farm land for the Chinese mining sector and industry, which pollutes their environment and affects their quality of life. Hundreds of Tibetans in a county in China's Gansu province staged protests this week [17-23 March 2014] over the seizure of farm land for the construction of highways catering to state-linked gold mining and industrial activities that are polluting the environment and destroying livestock, according to sources in the area. Unfurling huge banners criticizing what they called Chinese encroachment of local Tibetan land, the Tibetans gathered on March 16 and 17  to voice their opposition to the highway projects in Sangchu (in Chinese, Xiahe) county in the Kanlho (Gannan) Tibetan Autonomous Prefecture, the sources said. During the protests in the Hortsang township, they claimed that the authorities did not pay any compensation for their land, the loss of which has affected their livelihood, the sources said, adding that several protesters had been detained. Tibetans in Sangchu — where a Tibetan man burned himself to death at the entrance to a Chinese mining site in 2012 to protest against Beijing’s rule — have also held protests recently against the expansion of state-backed gold mining and industrial activities, Tibetan sources said without providing specific dates. Tibetans opposed to gold mining activities in the Dzo Zekhong area in Sangchu's Tsayue township, in their protests, attacked the authorities for disregarding Tibetan concerns over the destruction of the environment by the mining and other activities, another Tibetan from the county said. There are about 15 Chinese groups extracting gold in Tsayue township and the mining activities have fueled other industrial projects, the Tibetan said. "Multi-story buildings are being erected in the area and the Chinese expansion of activity is in full swing,” he said. "They have been digging for gold for years knowing fully well of the Tibetan concerns over its effects on the environment. The Tibetans have appealed to the authorities several times but there has been no positive response," the Tibetan said. "Now, more construction is coming up, and new factories are also being built in the area and adversely affecting the local environment, the Tibetan said. "Our resistance to the exploitation of our environment did have an impact in slowing down the projects but our concerns are being drowned by the strong support for the projects by the local county authorities," he said. The projects are impacting the environment through changes in weather patterns, residents said. Pollution is also harming the health of those living near the gold mine and industrial activities, according to them. 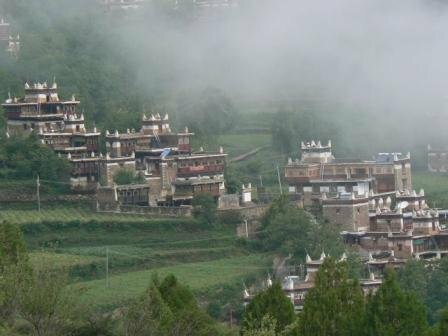 In Hortsang township, residents protested recently over pollution from a cement factory project in the Marthang area that they said has left birds and other wildlife dead, Tibetans in the area said. “The poisonous smoke [emitted by the factory] have killed birds and wild animals. The cattle of the Tibetans have also been affected by the Chinese industrial expansion in the area." "So the Tibetans protested against these projects such as the cement factory. Some officials from the county arrived at the protest site. Few Tibetans were detained but released later," another Tibetan said. "About 99 per cent of workers in the factory are Chinese immigrants. Managers of the cement factory had forced many Tibetans to sell their land," he said. Tibetans protested the construction of the cement factory as far back as 2010 but county authorities had called security forces to clamp down on the demonstrations, residents said. Mining operations in Tibetan-populated regions have led to frequent standoffs between Tibetans and Chinese authorities. Some Tibetans believe mining firms disrupt sites of spiritual significance as they extract local wealth but the government says such activities generated local employment and development.